This page contains reading comprehension questions, worksheets, templates, and puzzles to use with Jeff Brown's chapter book, Flat Stanley (His Original Adventure). 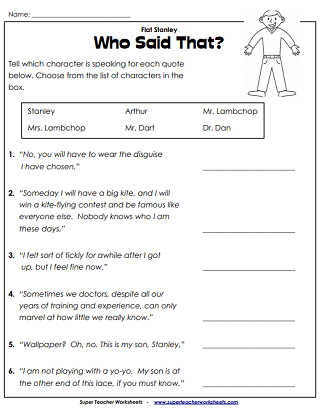 This page has multiple choice and short answer questions about Stanley's life as a flat boy. 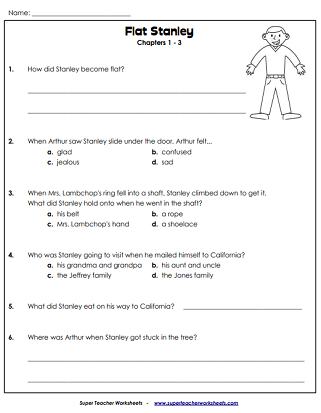 This worksheet features questions about Stanley's adventures catching the sneak thieves at the art museum. Answer the questions about Stanley's adventures. Includes multiple choice, matching, and short answer questions. Can you identify the person speaking for each quotation from the book, Flat Stanley? 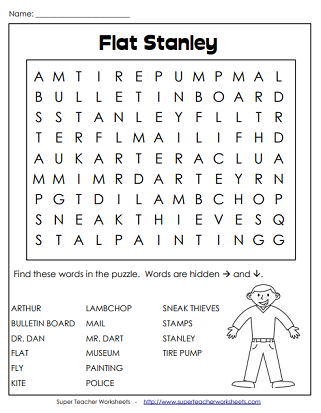 Hunt for hidden words in the puzzle, such as Stanley, Arthur, Lambchop, kite, police, and museum. Color and cut out this Stanley template. This template is a completely blank body, with no face, shoes, or clothes. This page contains four bookmarks. Cut them apart and your kids can use them to mark their place in the book. We have worksheets and activities covering a wide variety of children's books. Our collection includes Stone Fox, Freckle Juice, Magic Tree House, and many more.